For those that really love PC gaming, the majority will want to play games whilst using a keyboard and mouse set up. Whilst this is a great way to play games on your PC, there are other options. One such option is using a game controller. There are many game controllers available out there, including the Gamesir G4s controller. There is an argument that only purist PC game players will use a keyboard and mouse when it comes to shooting games. We’re not going to agree with or deny this fact. Having said that, there are times whereby a controller is a much better option. One such example is in driving games. When you consider that the general keyboard gaming setup is WASD and a mouse, this limits your control in racing games. The reason for this is that keyboard buttons are digital. The problem that this causes is that for steering you’re either going to have to tap a button repeatedly to get the desired steering curve, or you’re going to end up crashing since holding the button down means that the wheel will go into full lock mode. On the flip side, using a controller negates this issue and allows you a greater degree of control and immersion in your games. Likewise, with platform games it can feel a lot better holding the controller in your hand whilst making those crucial jumps, and an analogue stick can really help you with the precise angles that you may need in order to land the jump perfectly. This is the reason why many people that use PlayStation and Nintendo 64 emulators on their PC opt for a controller. You just can’t get the same level of responsive out of a mouse and keyboard when playing a game that was designed to be used with a controller. Similarly, it may be the case that you’re deeply involved in racing/driving simulators. In this scenario, a much better option would be to use a steering wheel. This offers a much greater level of control in simulation based games. However, this is the most expensive option (depending on the wheel that you purchase) so it’s not suited to everyone. Of course using a steering wheel also gives the player the option of force feedback technology, as well as using a shifter. This in turn greatly adds to how immersed they are in a game. As mentioned above however, there are genres that are much better suited to a keyboard and mouse setup. The biggest example of this is first person shooting games. 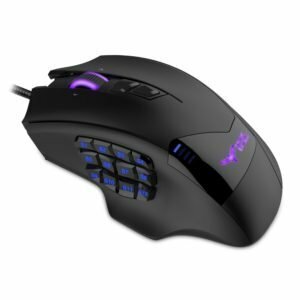 In an FPS, the precise level of control you get from a mouse is unparalleled when compared to that of a controller. Although this would depend on the sensitivity of the mouse as well as the quality of the controller in a side by side test. By and large though, a mouse will always come out on top . Likewise, RPGs and RTS games such as LoL and also Command and Conquer are much better suited to using a keyboard and mouse. With the keyboard, you’ve got a wider range of keys to carry out your functions, as well as the fact that some keyboards have a macro function on them. This is something that is missing from a controller, which would end up leaving you with a less satisfying experience. If you’re looking to get Steam and Origin games at a lower price, you should check out Kinguin who always have great deals on.